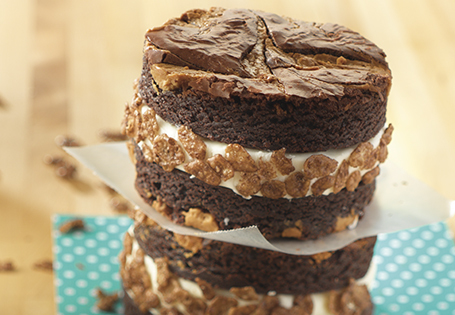 Vanilla ice cream sandwiched between freshly baked peanut butter brownies with a crunchy surprise. Preheat oven to 350°. Place two parchment-lined baking sheets in the freezer. Coat two 9x9-inch baking pans with cooking spray; spread the brownie batter equally among pans. Spoon half of the peanut butter over each brownie mixture and swirl together. Bake for 20 minutes or until toothpick inserted in the center comes out clean. Allow to cool to room temperature. Using a 3½-inch diameter ring mold, cut four circles from each pan. Remove from pan and place upside down on a parchment-lined baking sheet. Place in freezer. Remove one baking sheet from the freezer; place ring mold directly on sheet tray, fill with ¼ cup of the softened ice cream and smooth out. Repeat until you have four circles. Sprinkle with half of the cocoa rice cereal, press into ice cream. Place in freezer. On the second baking sheet, make four circles of ice cream, leaving the tops plain. Place in freezer for 5 minutes. To assemble: Using a spatula, place the ice cream with the rice cereal on top of the brownie (cereal side up), followed by the plain ice cream. Top with another brownie. Roll the edges of the ice cream sandwich in the remaining cocoa rice cereal. Repeat until you have four sandwiches. Freeze for 15 minutes. TIP: If you do not have a ring mold, you can cut the brownies into squares and spread the ice cream evenly over each brownie.